The mhealth Research Group explores how mobile and ubiquitous sensing might be extended and then used to support health and wellness through personal health informatics. As such, some projects have more of a technical, or computer-science flavor, and other projects have more of a public health or behavioral-science flavour. Most projects, though, combine both areas of interest. Listed here are our active projects, projects that are current dormant but that we would like to restart given student interest, and projects that are completed that are unlikely to be restarted as described (although all of our past projects are influencing what we do in the future). 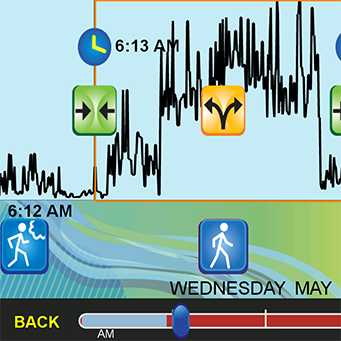 We are working on a variety of projects studying how to use mobile sensor data, especially from accelerometers, to detect physical activity (type, duration, and intensity), sedentary behavior, and sleep in adults and children. Accelerometer data from the wrist and ankle, and manually-labeled activities. We are developing algorithms to detect such everyday behaviors. We are creating a simple way for researchers to run algorithms on 18,000+ raw accelerometer datasets from the NHANES study. The purpose of this project is to study how “microinteractions” – quick interactions with smartwatches or devices like Google Glass – can be used to create new ways to continuously measure health behavior and provide opportunities for just-in-time health intervention delivery to support health behavior change and behavior maintenance. In micro-EMA on a smartwatch, only single questions with a simple answer are asked, but at a high temporal density. This project explores how mobile technology can be used to support active commuting via bicycling, where individuals who would normally be commuting by car may instead commute via bicycle. They may do this because of a novel technological system that would create a car-free riding experience, dramatically enhancing comfort and safety. We are looking for students interested in bicycling who want to help with this project, which is in the early stages. We are building a state-of-the-art bicycle simulator, to help support future research in this area. Concept image showing one aspect of the Virtual Bicycle Highways concept. Type 1 diabetes (T1D), also called insulin dependent diabetes and juvenile diabetes, is an autoimmune disease that afflicts 1.25 million Americans. There are 40 thousand new diagnoses each year, and almost half of those are children and adolescents under age 20 years. The costs for our health care system are enormous, estimated at $14 billion annually. T1D is incurable, and people with T1D are estimated to lose over 10 years from their life expectancy. We are designing, building, and evaluating interactive visualization tools to help T1D patients and their caregivers make treatment decisions. In these visualizations we are showing data we collect using multiple devices and have data on the patient blood glucose levels, insulin administered, food eaten, exercise, and stress to name a few. Our tools are used by patients to understand the trends between scheduled events such as mealtimes, bedtimes, and overnight as well as irregular events like periods of exercise, stress, and illness. With this information, patients will be able to make more informed changes to their treatment protocols. Prototype of a game designed to help researchers, by having game players label activities using accelerometer data. This study is focused on the development and testing of novel multilevel statistical methods to examine the effects of subject-level parameters (variance and slope) of time-varying variables in ecological momentary assessment (EMA) studies of physical activity. The results will have the potential to make notable methodological and substantive contributions for analysis of EMA data and in understanding the complex effects of contexts and psychological states on physical and sedentary activity. Given the detrimental health effects and enormous costs of physical inactivity, such information could be of significant value to efforts to improve public health. Part of the interface of the software developed for researchers interested in new multi-level statistical methods. We have developed and validated a smartphone-based Physical Activity Monitoring System (PAMS) that uses machine learning algorithms to detect various wheelchair-based physical activities (PAs) in community settings, estimate energy expenditure, and provide real-time feedback about PA levels to individuals with spinal cord injury. The objective of this study is to develop algorithms that incorporate each individual’s automatically detected PA level and a clinician’s PA level recommendation to provide a smartphone application that helps a person set safe and highly personalized physical activity goals. By adapting the goals in real-time based on the person's actual behavior, the system aims to keep the individual feeling positive and motivated towards a change in the PA behavior. In the PHIRE project, a smartphone, smartwatch, and wheel sensor are used to estimate energy expenditure. As part of our effort to explore the Virtual Bicycle Highway concept, we are gathering data on the Minuteman Commuter Bikeway, which runs from Bedford, Massachusetts to Arlington, Massachusetts. This is a great example of a bikeway that runs from the suburbs to the city. We are exploring how many people have changed their active commuting patterns because of the bikeway, and how much the bikeway has impacted the surrounding community. The Minuteman Bikeway runs through four towns and is heavily used by commuters. But there is more to learn about how and why it is used. Partial screenshot of the MobileTeens application, that used sensor data to help teens label their everyday activities using context-sensitive experience sampling. How can mobile devices motivate behavior change? One way might be to wait patiently, automatically detecting when someone does something just a bit better than what that person normally does using sensors such as accelerometers... and then providing context-sensitive, tailored encouragement. In other words, software on a mobile device might use computational sensing to detect behavior, and operant conditioning to motivate gradual behavior change. The goal of this pilot project was to develop and evaluate real-time pattern recognition algorithms that run on mobile phones and process data from miniature, wearable motion sensors (accelerometers) to detect patterns of smoking behaviors in free-living individuals. The specific aim of this pilot project was to explore the use of “games with a purpose” approach as a proof-of-concept to construct a UPC and nutrient database. A study with the Groden Center, a school for autistic children, and the University of Rhode Island to explore the use of wireless accelerometers for automatic detection of autistic stereotypies. These projects are currently not being further developed. This project extended the Hospital Buddy, a computer agent that provides continual health counseling and companionship during a patient’s hospital stay via a bedside touch screen computer equipped with sensors (RFID tags on staff, accelerometer on patient, acoustics) that can detect certain events occurring in the hospital room. 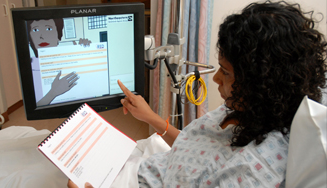 A patient using the Hospital Buddy system in a hospital. Here is a flash video of the concept. There is still a need for this type of system to be produced commercially. Wocket sensors were thin, lightweight custom sensors we designed for capturing multi-limb accelerometer data in research studies, using common mobile phones. The major goal of this pilot project was to establish the feasibility of using fNIRS to detect major changes in emotional state and to use a mobile system for context-sensitive self-report on that state change. The prototype suffered from substantial motion artifacts that we were not able to adequately filter out. This was a five-year study to develop and evaluate (in a randomized clinical trial) sensor-enabled mobile phone technology to assist young adults aged 18-35 with long-term weight loss and weight management for two years. We designed and created the mobile app and deployed it with over 200 people. Screenshots from the CITY Android application. This project developed portable sensor tools designed to be used in typical homes to collect data for computer science and health research (the BoxLab), as well as to generate shared datasets on home activity from actual homes to be used as a community resource to accelerate research. The Boxlab allowed data collection from any home, using portable sensors. The data were aggregated and then could be used for research using this visualization and annotation software. How can ubiquitous computing technologies be created that work for extended periods of time? How can persuasive interfaces designed to motivate behavior change in the home be studied in context? Dr. Intille's research group, in collaboration with partner TIAX, developed the PlaceLab - an apartment-scale shared research facility in a residential condominium building in Cambridge where new technologies and design concepts could be tested and evaluated in the context of everyday living. For a sense of the capabilities it had, watch the PlaceLab overview video, or the more light-hearted video that demonstrates all the sensing. The PlaceLab had to be closed prematurely and was replaced by the BoxLab. The PlaceLab was a real apartment that had hundreds of sensors embedded within the architecture, including cameras, object usage sensors, current flow sensors, water flow sensors, and more. 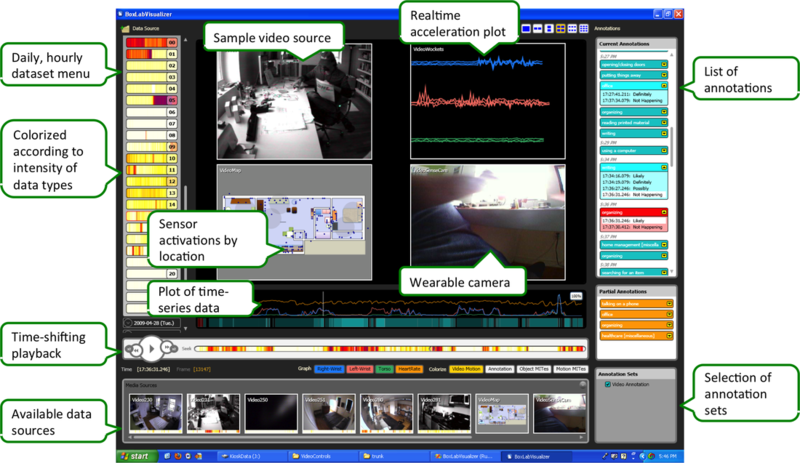 Data, including video, audio, and other sensor activation data, were collected and used for experiments, such as automatic recognition of activity. Can computers with computational sensing motivate behavior change? Over the years, the group has worked on several projects using mobile and ubiquitous computers to both measure and motivate behavior change. We are studying the intersection between new user interface design strategies, computational tools for studying behavior change, computational learning algorithms for context recognition and planning, and behavioral and social psychology. We focus on the evaluation of algorithms and devices we create in real environments. Much of this work involves measuring and motivating physical activity and healthy eating. One project developed a "GPS Thermostat" system that may encourage less energy use. Another investigated how point-of-decision prompting in a train station could impact behavior. ​A third looked at how to motivate less television watching (using a television remote control). 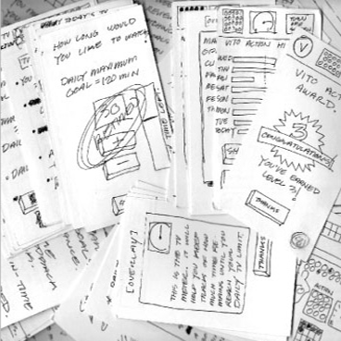 We use paper prototyping and other user interface design strategies extensively when building prototype systems to deploy in research studies on motivating behavior change.